Wild: One of the stranger creatures in the waters surrounding the island is Basilosaurus solatiumfecit. It’s a powerful swimmer which has adapted to the shallows so remarkably well such that it rapidly recovers from injuries when near the water’s surface. Conversely, it’s vulnerable to deep water pressure, which slowly cause it harm. Domesticated: Despite the hassle of engaging with its ornery followers, many tribes still attempt to tame the Basilosaurus, as its mammalian warm-blooded circulation provides a rider with perfect comfort from both heat and cold. Alternatively, Basilosaurus is hunted – perhaps too vigorously – for its special blubber, which can be refined into a far more efficient form of gasoline! Known Information: Basilosaurus is usually closely followed around by other predatory creatures, as its eating habits leave a large amount of scraps for scavengers to consume. It’s a gentle creature towards humans, and happily takes food directly from them. However, the creatures which trail the ‘Basi’ tend to become dangerously enraged whenever this happens, as it leaves no leftovers for them. 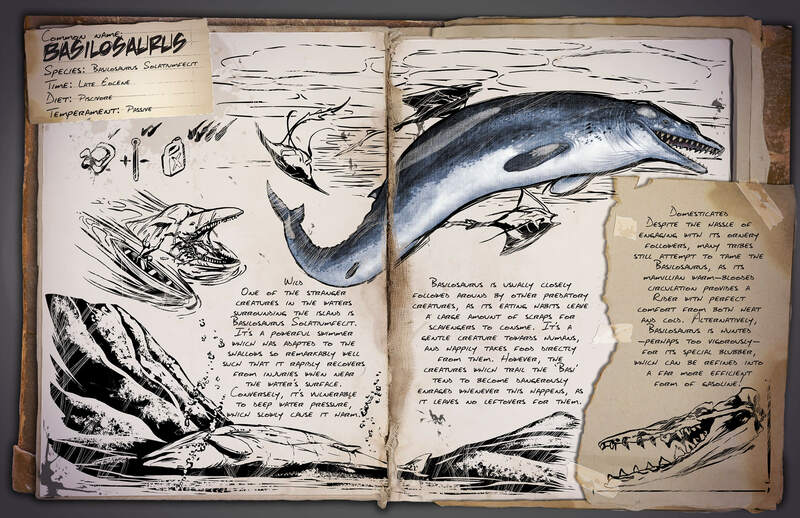 According to the dossier, Basilosaurus contains a special kind of blubber that can be refined in a (more efficient) form of gasoline. Furthermore, Basilosaurus will be another creature that can be used as a natural air conditioner source (like the Kairuku and Dimetrodon), due to its warm-blooded circulation.